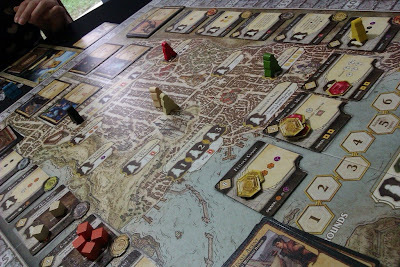 Lords of Waterdeep ( LoW ) was published by Wizards of the Coast in 2012 and came into the gaming market without much ( or any ) fanfare. It had actually slipped under my radar ( which I think is rare, haha ) and was brought to my attention by Tom Vasel who does reviews for The Dice Tower. It received a glowing review and it seemed like something I would very much enjoy, so I did what any normal gamer would do, open my wallet and pony up some cash. Haha. Is it any good ? Well, let's find out ! Each player starts the game with a faction ( which has no unique abilities ) and a Lord card ( which rewards end game points for meeting certain criteria ). They also each receive 2 quests that are face up for all to see. Quests are the main way to score points in LoW, and all uncompleted quests for each player is always displayed face up so that all players may see what the others are shooting for. LoW is played over 8 rounds, and during each round players take turns placing their agents on the board to obtain resources so that they may build buildings or complete their quests. The board in LoW starts out very simple with one area each for each of the 5 resources. There is also an area for obtaining new quests, building a building and for playing action cards which also allows for reassignment of that agent. After placing an agent on the board, the player has the option to complete one quest if he/she can meet the quest criteria. Points are scored immediately and completed quests are placed face down on the player’s mat. Some quests offer ongoing abilities that the player may utilize for the rest of the game. The way the game stays different is through the different buildings that the players may build. Once a building is built, it counts as a new area where players may place their worker and obtain the specified benefits. These benefits consist of more resources, more points, more quests, and even an additional worker to use for the next turn. And the owner of the building gets a smaller benefit when the building is utilized by other players ! After 8 rounds, any unused resources will score points for the players, and then the players will tally up the points granted by their Lord cards. The player with the most points is the winner. LoW actually does play as advertised. 60mins is very possible with 5 experienced players. Most of my games have taken no more than 75mins and I think that’s a really nice timing for what you get from the game. LoW is also very easy to teach and to understand. A lot of people will get it after 2 turns and from then on its simply game on. I love how the buildings make each game different and how it gradually opens up areas of greater use for each player. The ownership mechanic is not new ( as it was introduced in Caylus ) but it is seldom used in other games, thus it still feels very rewarding and refreshing in LoW. Buried among the quest types in LoW are particular quests that are known as “Plot Quests”. These quests give players a permanent ability once it has been successfully completed. I like that these quests are not necessarily easy to complete, and their rewards are low in points but high in variable points / additional powers. It’s not always a good idea to complete a plot quest, it’s the timing and type that you need that makes you decide how much effort will go into the quest itself. LoW seems pretty balanced from all my plays of it. There is the luck of the draw to consider, but overall it has never given me the impression that some cards or quests were out of whack. Most games are also not decided until the very end as there are end game points to be scored and last minute quests to be completed. LoW may come advertised as a Dungeon & Dragons game, but the theme is transparent and holds no weight in the game. The cubes are just cubes and will never stir up enough for anyone to think they are the so called fighters and wizards in the game. Each quest and card may come with flavor text but never really invoke the feeling epic battles and cunning thievery that appears in the game. A lot of people really love the game insert that comes with LoW. It was specially designed to hold each piece tightly and in a particular area. It looks pretty but its far from functional. Each piece has to be placed in a particular way and lined up in a very rigid order. This makes the set up easy but the keeping extremely difficult. The money tokens and building ownership tokens have to be so neatly aligned to fit into the box that it really is extremely annoying. Lastly, the box lid doesn’t cover the entire box. Enough said. Sheesh. Lords of Waterdeep is a light worker placement game. As long as you go in knowing this, I am quite confident that you will find it fun for the duration of the game. It succeeds in what it’s trying to do, which is being a simple barebones worker placement game that can be enjoyed by anyone who is willing to sit down and listen to a rules explanation. It may be too simple for someone who has played multiple renditions of different worker placement type games, but I think LoW cannot be discounted just because of that. It may not try to add anything new, but it takes old tried and true mechanisms and combines them perfectly to make a game that is most importantly, fun and enjoyable. nope, not in my possession yet. Yeah, the expansion really adds a lot of variety to the cards and quests, not to mention the whole corruption thing. Also it's a minor point, but the various types of adventurers actually do have subtle thematic differences in how they relate to the game overall. For example, black rogues are used most in Skullduggery quests, and those skullduggery quests tend to have slightly different types of side effects when completed, such tying together gold with rogues (because they're fencing stolen goods, etc). On the other hand wizards are harder to recruit than rogues and tied closely to Arcane quests which again have slightly different special side effects, such as giving you intrigue cards or the arcane quest that lets you share a space with an opponent. So when you look closely enough you can see that the cubes aren't all identical but painted differently, they actually have slightly varying influences over different parts of play. The quests in the expansion further enhance those differences, there's a lot of expansion quests with unusual side effects on completion.